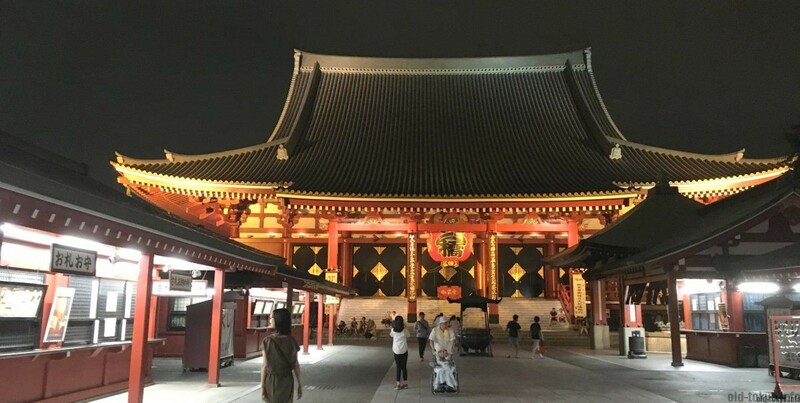 The best time to visit Asakusa? Go at night! Asakusa, main ambassador of traditional Japan in Tokyo. Unfortunately, due to the large crowds and overly touristic atmosphere, I admit that I never was a big fan of this place. When I first arrived in Tokyo, I got dragged several times to this Tokyo neighbourhood. While the temples and shrines were nice, it did not have the charm of Kyoto, which is equally crowded with tourists. Rather, I found the touristic elements too pushy for my taste. So why bother visiting this place? It was only when I became a long term resident of Tokyo that I started to understand the significance of this area and that I started to explore more of the side streets and adjacent neighbourhoods. Asakusa flourished in particular from the mid-18th century until the start of the early 20th century as a center of common people’s culture. It was the main entertainment district with theatres and cinemas. Asakusa was the place where you could find kabuki theaters and also a large red light district. Of course, Asakusa goes way back, Senso-ji is Tokyo’s oldest temple founded in the 7th century. But the current buildings are not that old, as they were all rebuilt after the second World War. Asakusa lost its place as prime entertainment district in Tokyo after the war, when other areas such as Shinjuku rose to prominence. From sunset until around 11 pm, light up of Senso-ji temple. Even though a lot of the entertainment moved away, Asakusa stayed a popular place, with large crowds of tourists flocking to the rebuilt temple and adjacent shops. This kind of makes it difficult to stroll around freely without getting stuck behind groups of tourists. A solution to this is by going early in the morning, or rather, at night as the area has beautiful atmospheric lights. A lot of the shutters of the shops have also well-coordinated paintings and drawings. Naturally there is the downside that you cannot visit the shops and buy many of the goodies. If that is important to you, I would recommend to visit in the morning on a weekday. However, it cannot beat the relaxed and quiet atmosphere you will get after dark. Beautiful art on the shutters in Asakusa. Dembo-in-dori is one of the most cozy and beautiful shopping streets in Asakusa, which is particularly appealing in the dark. The street is named after the Dembo-in temple that is on this road, a small temple famous for its garden (unfortunately only open to the public during a short period each year in spring). This road has beautiful artwork on the shutters of the stores. More shutter art, on Dembo-in-dori. 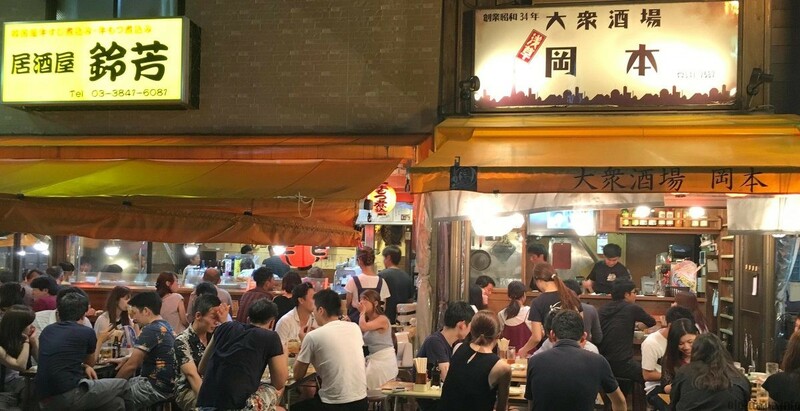 West of the Senso-ji temple grounds is a small street full of eating and drinking places, called Hoppy Street (also referred to as Koenchi), where you can sit outside and enjoy a beer or some yakitori at an izakaya (Japanese style pub). Izakayas are all over the place in Tokyo, but being able to sit outside is rather uncommon. There is not one of these that is famous, so pick whichever you like (and where there is an empty seat). On Hoppy street, street west of the Senso-ji grounds with many izakayas, with outside terrace! Hoppy Street is named after Hoppy, a beer-flavoured low-alcoholic drink (0.8%) that was popularized in shitamachi as beer was too expensive just after the second World War. Hoppy was first sold here in Asakusa in 1948. Hoppy is not consumed on its own these days, but together with a shot of shochu. If you feel hesitant to go and sneak into the street, join the Asakusa nightlife foodie tour with a local guide! 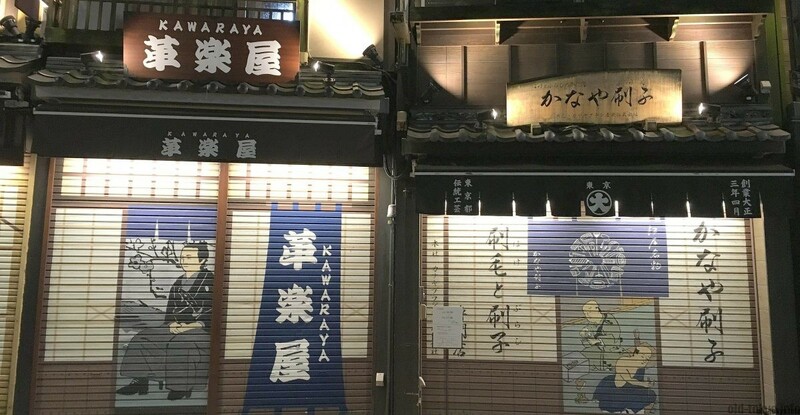 You can visit hidden local bars in the backstreet alleys and enjoy drinking with delicious authentic Japanese food like a local with Magical Trip! Start your trip to Asakusa after 19:00 when Nakamise-dori closes down. Walk from Kaminarimon (1), through Nakamise-dori (2) all the way up to Senso-ji (3). Then walk west through Okuyama Mairimachi (4), continue down through Hoppy street (5) also called the Koenchi neighbourhood. Finally get into Dembo-in-dori (6). This article was originally published on 10 September 2016, update at the end of December 2017.